For five generations, the Fitzgerald family has called the Blessed Sacrament on LaCrosse Avenue in St. Paul its spiritual home. Many returned one last time to say goodbye to the parish building, which closed after a final Mass Jan. 11. The church building, school and rectory are in the process of being sold to a charter school. The parish will continue to worship nearby at the former church of St. Thomas the Apostle, which merged with Blessed Sacrament in 2011 under the latter parish’s name. After the Mass, the parish’s pastor, Father Donald DeGrood, walked around the interior of the church building and chose several items, including a chalice, to take to the parish’s sole location. 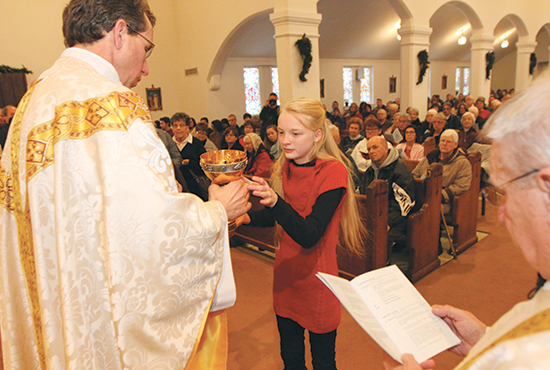 The Mass drew more than 200 current and former parishioners, including one from Salt Lake City, Utah. As the bells struck on the hour, Father DeGrood said, “I declare this building of the Church of the Blessed Sacrament closed.” It was more than an hour before the last person left the building, as if they were trying to grab one last moment in their beloved worship space.